Abstract When the concept of Mobile Commerce was first introduced in 1997 at the launch of the Global Mobile Commerce Forum, Nobody imagined that by the end of it’s teenage in 2017, M-Commerce would reach a staggering worth of $230 billion. The driving factor of this growth has primarily been the immense growth of the mobile phone, especially smart phone , industry in the past decade. The provision of Mobile Value Added services (MVAS) by the network providers has triggered the entire development making M-Commerce a huge industry today. One of the biggest driver of this growth has also been the introduction of mobile apps in the past decade and through this whitepaper, we would look at the impacts an app has on the M-Commerce segment. © 2006-2014 SoftProdigy. All rights reserved. Reproduction of this publication in any form without prior written permission is forbidden. Introduction- M-Commerce When we talk about M-Commerce, We are referring to the transaction of goods and services on mobile devices such as Cell phones, PDAs etc. which are not only electronic but also mobile in nature. The M-Commerce market has been hugely affected by the ever increasing sales of cell phones across the world. In fact, by the end of 2017, the sale of the twentieth billion mobile phone would have been made. This is also one of the reasons that the Mobile commerce market is expected to grow at a 300% faster pace than the traditional ECommerce. However, one of the biggest advancement in the mobile industry which has turned out to be a boon for M-Commerce has been the development of mobile applications in the past decade. According to a recent research, more than 85% of the time spent on a smartphone is on mobile apps. This refers to the payment services operated under financial regulations o a country and carried out on a mobile device. In many developing economies, mobile banking has been used as a means of extending financial services to the underbanked population. It includes services like Mobile wallet, SMS based transactions, direct mobile billing, contactless NFC etc. © 2006-2014 SoftProdigy. All rights reserved. Reproduction of this publication in any form without prior written permission is forbidden. In order to browse the websites on phones and PDAs, the mobile browser technology has played a significant role. Today, the full featured browsers are capable of HTML, CSS, ECMA Scripts as well as WML etc. Currently, Android leads the market as the most popular mobile browser. Marketing activities carried out on cell phones and PDAs come under Mobile Marketing. This includes SMS/MMS Marketing, App based marketing, In-game Mobile marketing,, QR Codes, Bluetooth, LBS etc. With the growth of mobile usage by 58% year to year, this becomes more prominent. With the evolution of 4G and high speed internet, there has a been a rise in content sharing across the M-Commerce domain. This involves media content such as pictures, videos, songs etc. For example, services such as Netflix have come to life owing to this fact only. Capitalizing on the Mobile feature of the wireless devices, the MCommerce industry provides various location based services to the users. These involve services such as localized discounts, geotagging, Turn by turn navigation to any address, location based recommendations of other services etc. Mobile Apps and M-Commerce Compared to the 29 hours a person spends monthly on the apps of his cell phone, he spends only 3 and a half hours on the browsers. This clearly reflects the dominance of mobile apps in the M-Commerce industry. According to research, an app can increase the sales of a normal E-Commerce business by up to 45%. In US, 2015, over 950 million people accessed shopping websites via mobile apps alone. 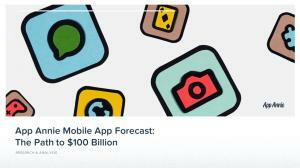 By 2017, the total number of apps to be downloaded worldwide might reach to 270 million leading to a revenue of approx. $42 billion. Gone are the days when mobile phone was used for mere calling purposes. Now let us have a look at the benefits that the apps provide to a customer in the M-Commerce segment © 2006-2014 SoftProdigy. All rights reserved. Reproduction of this publication in any form without prior written permission is forbidden. Benefits of an App in the M-Commerce segment . Online Ordering The most primary benefit of all. It has been observed that offering the users to browse through your products and making a choice has a direct impact on your sales. In 2015, Mobile apps accounted for more than 35% of all online sales. Push Notification The average opt in rate for push notifications in MCommerce is 46% and they result in 92% higher retention rate. 60% of the people who opt for push notifications do it to avail the exclusive offers and 54% of these actually get converted. Value Added Benefits Incorporating Value Added Benefits to customers always boosts sales for any business. In 201, 67% people said that they used apps for the exclusive benefits offered via apps. Simple data mining can help a business offer customized Value added benefits to a customer. Convenience Convenience is the factor that makes a customer come back for the service. For example: Delta airlines app offers the passengers to book the ticket, choose the seats and even display the boarding pass through the app. 95% of the users prefer apps because of the convenience factor involved. Report "SCOPE OF MOBILE COMMERCE Impacts of a Mobile App"